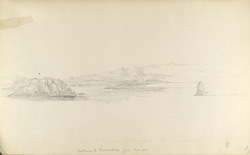 Pencil drawing of Karachi harbour by George Boyd (1800-1850) dated between 1821 and 1844. This is one of 95 drawings (90 folios), mainly of landscapes and monuments in the Deccan, West India and Afghanistan. Originally Karachi was a small village made up of a cluster of fishermen’s huts on the three islands of Manora, Bhit and Baba. The town has always been an important gateway for trade into Central Asia due to it's location at the western end of the Indus delta . Port developments were carried out in the mid-19th century to accommodate an increasing number of ships from international ports carrying goods to and from the subcontinent; cotton and wheat were particularly important commodities. Today Karachi is the largest city of Pakistan and the capital of the province of Sindh.